The Symbol SPT 1800 has reached end of life. It has been replaced by the Motorola MC1000. 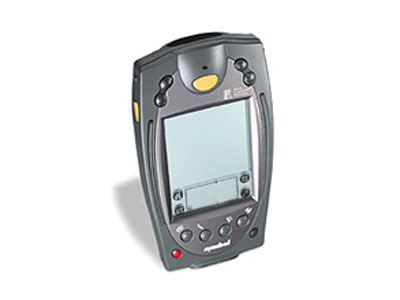 The SPT1800 family continues the revolution of Pocket computing, combining integrated scanning, sophisticated connectivity and ruggedness with the popular Palm OS platform. New and improved processor and scanner from the SPT1700. Tough enough for use in manufacturing and industrial environments, the SPT 1800 Series enables the Palm OS to perform practically anywhere. The rugged SPT 1800 housing is sealed to IP54 standards for protection against rain and dust, and withstands 4 ft./1.2 m drops to concrete. Symbol's state-of-the-art scan engine with bright, easy to see scan line, delivers premium scanning performance under virtually any lighting condition–even sunlight or bright artificial light. A high-contrast, anti-reflective liquid crystal display makes data easy to read in low lighting or outdoor conditions. The SPT 1800 will be discontinued as of June 30, 2007. Limited stock remains, order now while supplies last! Download a free trial of AccuScan Palm - user friendly scanning software! Find it faster! Click here to compare SPT 1800 models by feature. 8MB RAM, 4MB ROM (Stylus, Slip Case, and Lithium Battery) Cradle sold seperately. CBL1700-100U Serial Charging Cable with P/S and Line Cord.